Single molecule array (Simoa™) testing is a powerful new technique that is orders of magnitude more sensitive than standard sandwich based immunoassay techniques. 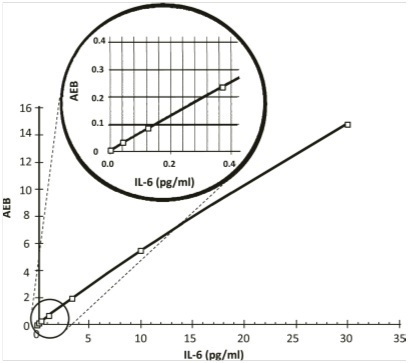 Traditional ELISA measurements are limited to pg/ml levels of detection. The RayBio Ultrasensitive Simoa Testing Services can achieve sensitivity as low as femtogram (fg/ml) levels, allowing the detection and quantification of biomarkers at concentrations previously difficult or impossible to measure. See below for a list of available analytes. Don’t see the target you’re looking for? We have a library of thousands of ELISA antibodies which can be converted to the Ultrasensitive Biomarker Testing platform. Simply fill out the form below to request the target you’re interested in and we will contact you with a quote. Please note: the conversion requires an additional 4-6 week lead time. To receive a quote*, fill out the sample service form linked below and email it to orders@raybiotech.com. Simoa is based upon the isolation of individual immunocomplexes on paramagnetic beads using standard ELISA reagents. 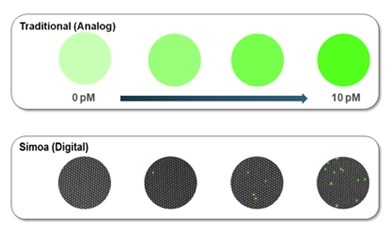 The main difference between Simoa and conventional immunoassays lies in the ability to trap single molecules in femtoliter-sized wells, allowing for a “digital” readout of each individual bead to determine if it is bound to the target analyte or not. Saloumeh K. Fischer et. al. J, Mortberg E, Provuncher G, Fournier D, Duffy D, Rubertsson S, Blennow K, Zetterberg H, Wilson D.
Neselius S, Zetterberg H, Blennow K, Randall J, Wilson D, Marcusson J, Brisby H.